"... thoughtful, suspenseful, and stunningly well written ..."
Available as an eBook at Smashwords, Amazon, Barnes and Noble, Kobo, Apple, Blio and other fine eBook retailers. 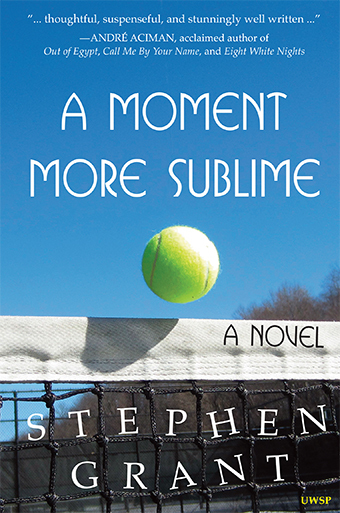 Set in contemporary London, A Moment More Sublime is the riveting story of Tom Phelps, a philosophy teacher and tennis buff, who finds himself unexpectedly embroiled in his union’s struggle against a corrupt school administration and its plans to cut jobs under the pretense of modernization and fiscal austerity, just as he and his partner Sofia are getting ready to buy a home and start a family. What Tom thought would be a routine academic year teaching Aristotle's Ethics and playing tennis at their local club with Sofia on the weekends, turns out to be a year of professional turmoil and strained commitments. Stephen Grant is a British philosopher, educator, and trade unionist. He teaches at Richmond upon Thames College in London, where he is also an elected representative of the University and Colleges Union. From 2010 to 2012, he was one of the leaders in a labor dispute to prevent up to a quarter of the lecturing staff losing their jobs. A Moment More Sublime, his debut novel, was partly inspired by events from that period. UWSP: What inspired you to write A Moment More Sublime? SG: This book was inspired by my experiences as a long-time philosophy teacher. Any major educational institution requires you to confront eccentric colleagues, sexual tensions, and some desperately needy and not-so gifted students studying alongside others boasting obvious talent and self-sufficiency. Against this background a teacher must somehow educate groups of people, and under any circumstances this provides plenty of fertile material for entertainment and reflection. The more specific motivation came when I unexpectedly found myself at the forefront of a battle to prevent what many of us felt to be a deeply unfair attack on us by a very aggressive management. It struck me that there was scope to develop a work of fiction that addressed some of the very serious issues this raised in the context of the comic madness of a large school. UWSP: How did A Moment More Sublime come about? SG: The teaching staff at the school where I work suddenly found themselves under threat of losing their jobs on the supposed grounds that the college needed to make major financial savings. These savings were to leave senior managers wholly untouched, and many even received pay rises. This provoked an extreme sense of anger in many ordinary staff, but alongside the outrage there was also great humor generated by some of the decisions taken by managers. At one point the union discovered the existence of a secret report compiled by consultants which managers had tried to conceal. We forced them to send it to us by putting in a request under the Freedom of Information Act. They sent us a redacted version which one of the IT staff was able to ‘unredact’ within a few moments of receiving it. The aim of the book was to address fundamental issues about fairness, but to do so in a way that reflects the often-farcical incompetence of those in charge, who seem to be screwing up as much of the world as they can. UWSP: What, would you say, is the main or most important thought or insight of A Moment More Sublime? SG: One of the plot lines in the book deals with the teaching of Aristotle’s Ethics, and central to this work is the issue of character. The most important theme of the book is about how people of different character act and react under pressure, and what they do when confronted by fundamental moral choices. The book addresses relationships of love, rivalry, friendship and opposition, and how those relationships are affected by the difficulties that the key characters must face. It is also a book about dignity. The union leadership at my college took a decision very early on in our dispute with the management: we would rather fight and lose than simply roll over. It is not enough simply to point out the injustice you are up against, you must do something about it. I felt that this kind of David vs. Goliath situation would make for a bracing and entertaining read. UWSP: A Moment More Sublime both keeps its readers at the edge of their seats and allows them to engage in deep philosophical reflection about life, love, friendship, greed, loyalty, betrayal, and luck. How did you go about interweaving the philosophical and the narrative so as to achieve your novel’s singular level of “thoughtful suspense”? UWSP:	What readership do you have ideally in mind for your novel? And how would you describe your novel’s differences in appeal for readers across the age spectrum? SG: I hope this may be seen as a novel for the ninety-nine percent. The central characters are fighting because they believe in something better. They want to be treated fairly and to contribute something of value. It is a novel about those who do not seek out conflict, but can’t help feeling a sense of great injustice and a desire to confront it in the name of a better set of values than the ones imposed on them by the powers that be - those in positions of authority. 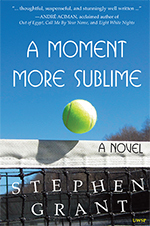 Thus, A Moment More Sublime will appeal to the middle- and high-school student confronted with a school administration whose decisions do not seem to make sense as much as to the corporate drone chafing under her managers and CEOs, or to any underdog, for that matter, desiring to improve the conditions of the world we live in. More generally, my novel will appeal to anyone eager to be swept away by a suspenseful story of love, betrayal, and reversal of fortune - which, I would imagine, applies to most of us. UWSP:	Do you have any favorite novelists, and if so, did you have any particular contemporaries of precursors at the back of you mind as you were writing A Moment More Sublime? SG: There were two writers whose style I was particularly interested in when writing the book. These were Albert Camus and Ernest Hemingway. In each case, what interested me was the stripped-down, Spartan prose, which I felt to be appropriate for book about austerity. That said, I also wished the book to contain elements of humor, and was deeply impressed by the works of writers such as Gary Shteyngart, Joshua Ferris and Sam Lipsyte. All manage to combine amusing satire with brilliant social insight. The novelists whom I read are overwhelmingly modern American ones, the reason being that they tend to have a more contemporary focus for their work. This contrasts with the most prominent British writers, whose work is often more historical in character. Aside from those I have already mentioned, I would pick out Philipp Meyer and Dave Eggers as those whose work I most admire. UWSP: Whom would you pick to play Tom, Dickie, and Sally, if A Moment More Sublime were to be turned into a movie, and why? SG: A key decision would be whether you locate the film in the British setting it has in the book, or whether you decide to rework it and set it in the States. Given some of the high-profile industrial disputes seen in both countries, I think it could work either way. If it were set in the States, then Danny DeVito would be a good pick for the small and vile Dickie, reprising the same sort of character he was playing in Other People’s Money or LA Confidential. There are any number of great actresses who could play the role of Sally, although I think Julianne Moore or Susan Sarandon would be my pick given their range. Tom could be played by Mat Damon or Ben Affleck, both of whom combine good looks with a strong presence. The role of Barry should go to DeNiro in a last great performance. It is time the best American actor of the last thirty years was given another proper role. The dream would be to cast Penelope Cruz as Sofia. British casting would also present many options. Dickie could be played by Warren Mitchell, whose terrifying presence in Red Riding could be toned down a little to give him the suitable combination of the dangerous villain who is also somewhat comical. Sally should be played by Natasha Little, and Tom should be played by Dominic Cumberbatch or Rufus Sewell. Both have a powerful onscreen presence and the sort of good looks which would help at the box office. Daniel Day Lewis will have to be lured in to play Barry and Penelope Cruz can retain the role of Sofia in the British production. © 2014 Upper West Side Philosophers, Inc.